MainAll NewsDefense/SecurityWill Israel accept waves of incoming Syrian refugees? Will Israel accept waves of incoming Syrian refugees? With some 60,000 refugees in southern Syria heading towards Israeli border, senior official says Israel won't accept refugees. The Israeli government is weighing its options as tens of thousands of refugees fleeing the Syrian civil war head towards the Israeli border. Some 50,000-60,000 Syrians are reportedly making their way towards the Golan Heights in northern Israel amid an ongoing campaign by Assad forces in southern Syria which has killed dozens of civilians. Regime forces continued bombing targets in the Daraa district Thursday, targeting rebel strongholds in the area. The fighting has prompted large numbers of residents to flee the area, including tens of thousands looking to leave Syria and request asylum abroad. 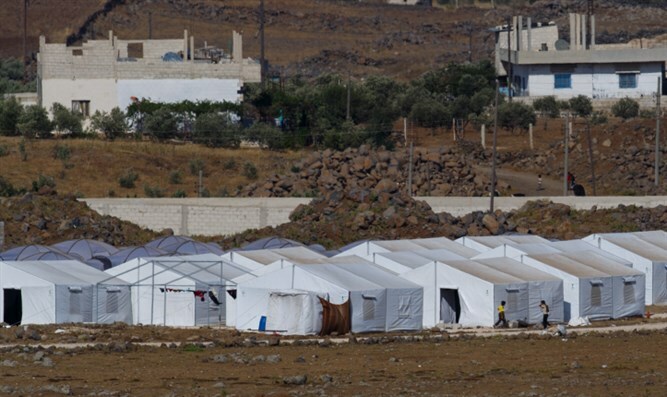 On Wednesday, the United Nations Office for the Coordination of Humanitarian Affairs (OCHA) reported that 45,000 people had been displaced, most of them refugees attempting to seek asylum in Jordan, just to the south of Daraa. But Jordan has refused entry to the refugees, saying that it could not accept more Syrians into the country. In 2014, Jordan sealed its border with Syria, after it accepted hundreds of thousands of refugees. While the United Nations has registered 650,000 refugees in Jordan, a government census has placed the number at over 1.2 million. Since then, as many as 60,000 Syrian refugees from Daraa have made their way towards the Israeli border. On Thursday, a senior Israeli official said that Israel would not permit the refugees to enter Israeli territory, but would offer humanitarian assistance. According to a report Thursday night by Channel 10, a senior Israeli official said that Israel would do what it can to help the refugees, short of allowing them into the country. In the past, Israel has provided food and medical supplies to civilians near the Israeli border. Thousands of Syrians have also been brought to Israel temporarily for medical treatment. Israel may also approach Russia with a request that Russian forces intervene to ensure that Assad’s forces do not target civilians in Daraa. The ongoing campaign in the Daraa district has reportedly been undertaken with the support of Russian forces stationed in Syria.